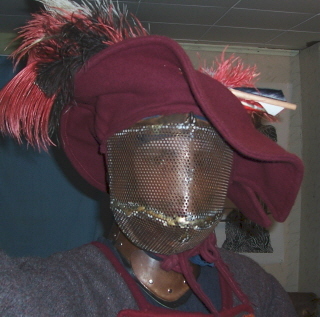 In an attempt to be the pimpin'est Landsknecht persona to ever enter an SCA rapier list, I have made this simple helm for SCA rapier combat, and a few things to go along with it. 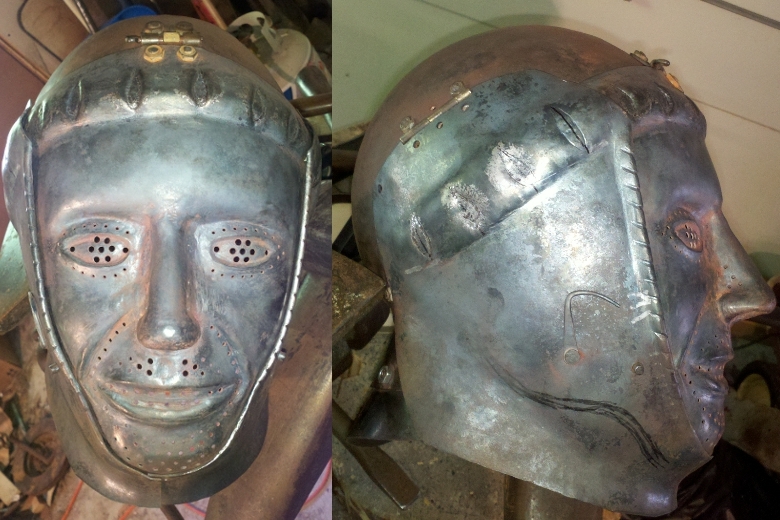 I'm not wearing all my normal protective gear in these pictures, so there are some gaps around my gorget where there are normally no gaps.... but anyways, the helm was designed with a simple skullcap in mind, with the addition of a face plate to make it list legal for my SCA kingdom. 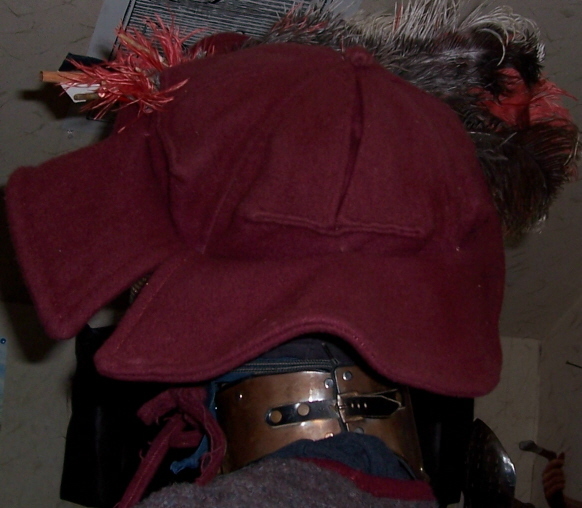 The faceplate is removable and is held in place by a steel hook/loop and a strap around the back; the skullcap is held on securely by a chinstrap. 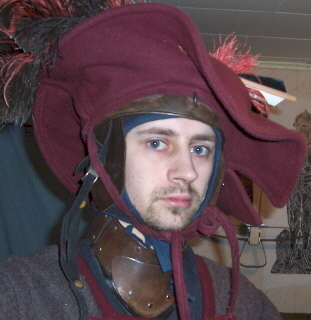 I wear a close fitting arming cap under the helm, and usually wear a hat over it - as was often done in period, I guess to keep the sun or rain off (as I've found it does both rather well). Below are a few additional pictures. Arming cap, addapted from the padded coif pattern which is somewhere on my site. Arming cap and hat. Some 16th century artwork shows hats being worn over arming caps or similar types of close fitting caps. 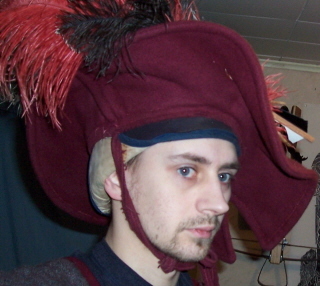 I've found that the larger hat is somehow easier to wear if its over an arming cap, it seems to stay in place better and be more comfortable. Mosquitos and other pesky bugs don't seem to bother me as much when I wear this hat, I'm guessing they are scared off by the feathers. Hat worn over the skullcap, skullcap over arming cap. 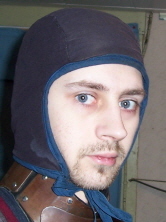 The Gorget is something I only wear for SCA fencing, but I do sometimes wear the skullcap like this as a sort of "costume armor". Only drawback is that the leather cheek/ear flaps over the padded cap make it slightly harder to hear... but I still sometimes wear the skullcap without a faceplate as my normal reenactment gear. ...and now with the faceplate. I wanted to look pretty much the same while in or out of fencing gear. Rapier helms that are "more helm" than this tend to look like the wearer forgot to put the rest of their armor on (such as a burgonet, closehelm, morion, etc.) 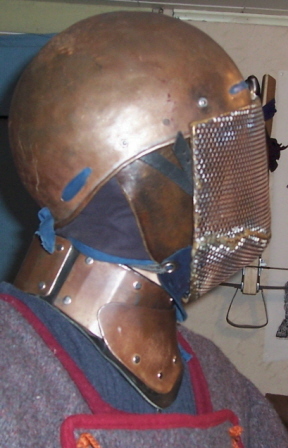 and I've always thought standard fencing masks look a bit odd. Hat and skullcap from the back... looks pretty much the same as if I was not wearing the skullcap. The hat is sort of based on hats with wide brims and square flatish tops which I've seen in several paintings and woodcuts. Somewhere I thought I'd seen one that was more round or octagonal, so I folded in and sewed the corners of mine to give it that appearance, but have been unable to find where I thought I saw something like that. I'm sure I'll find it somewhere, I know the square ones can be found in artwork by Durer and Bruegel, as well as a lot of other early to mid 16th century artists.